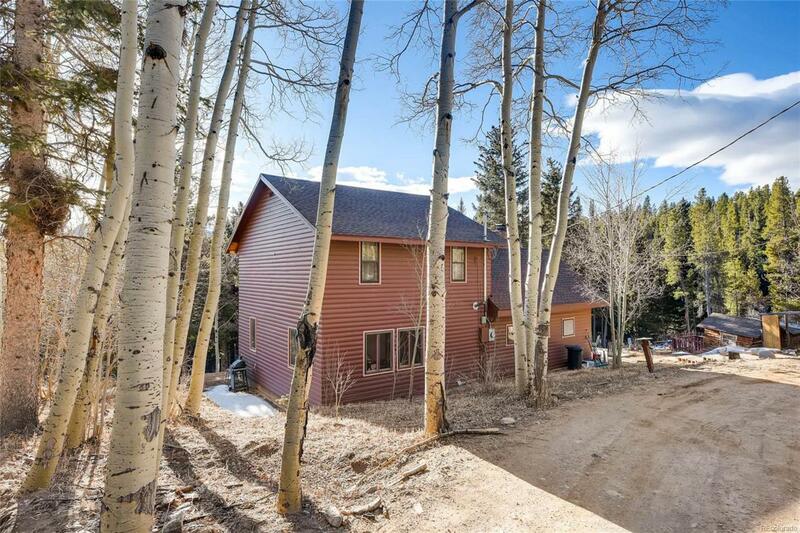 Welcome home to a cozy and charming mountain home in Gilpin county. Home features of mountain living are so many. Lots of tongue and groove knotty pine, cozy kitchen, new carpet. Unique fireplace and loft, barn and storage buildings. Price includes bonus lot of 0.8 acres across the road. It is fully fenced for horses. Wind down on a picturesque drive home to gorgeous views and an acre wooded lot in a forest setting. Mountain living at its best providing serenity and quiet w/ fenced yard. Creek runs along edge of property. Mountain views of Sleeping Giant Mountain from the master bedroom. Well water permit, septic, propane gas tank owned by seller included. This home is central to both Black Hawk and Nederland. © 2019 Information and Real Estate Services, LLC. IDX information is provided exclusively for consumers' personal, non-commercial use and may not be used for any purpose other than to identify prospective properties consumers may be interested in purchasing. Information is deemed reliable but is not guaranteed accurate by the MLS or 8z Real Estate. Data last updated: 2019-04-26T08:37:54.063.